THE SCENE: To my sixteen-year old nephew Star Wars has always existed, whereas I distinctly remember life before Darth Vader. By the same token I don’t remember a time when dub music didn’t exist, as its melted beat-eat-eat-EAT-EAT-EAT has always been a part of my listening experience. Dub was created in the late ‘60s by Jamaican producer King Tubby, who daringly dropped lead singers in and out of their own recordings while bathing instruments in milky delays and boxy distortion. It was an instant, massive hit and much pillaged sound. Meanwhile, Jamaican producer and musician Augustus Pablo was gaining major international respect due to his mastery of the melodica, a child’s instrument that looks like the love child of a plastic flute and a toy piano. In 1975 he paired with King Tubby to record and remix tracks that became the landmark King Tubbys meets Rockers Uptown. Like a jungle predator, Rockers Uptown gives the listener heightened sensory powers. The bass is ALL bass, no high-end, no mid-range, just strong, sweet deep bass. Cymbals are ALL treble, sneaky and clicky. Every other sound is time shifted, dissolving at the moment of recognition, like the faded memory of a dead loved one. “Keep On Dubbing” has a watery drunken piano and a smoky horn section gait that’s akin to traveling along the island, onward and inward, hot like the Jamaican sun. The slow rubbery vibe continues in the scratch percussion of “555 Dub St”. and the slo-mo dishwasher drums of “Satta Dub”. 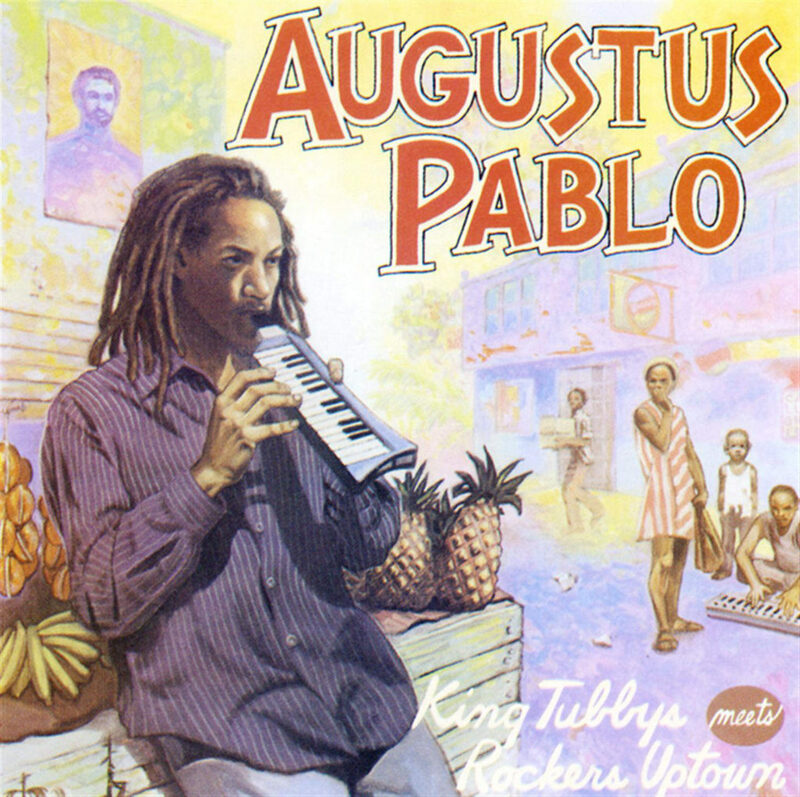 Pablo’s melodica notes float like bubbles through the air in “King Tubby Meets Rockers Uptown”, its childlike innocence wafting along the ominous rhythms. Hollow drums ping-pong double time into infinity, guitars are delayyyyyed and pop up like muscle tremors. The ghost vocals of reggae singer Jacob Miller haunt “Each One Dub”. His refrain “Tomorrow will not be the same same same same…” dissipates into a wall of wet organ notes. Since all of these songs started with such strong compositions, the dub versions manage to create their seductive druggy magic with a minimum of gimmickry, and a maximum of head-bopness. THE FALLOUT: Rockers Uptown was a watershed album upon its release, catapulting Augustus Pablo into one of the leading lights of reggae music. Alas he was overshadowed by Bob Marley internationally, and this album had little presence outside of reggae circles. An art form that only could exist with the advent of multitracking, dub is the first post-modern music genre and is the godfather of hip-hop, electronica and ambient music. King Tubbys meets Rockers Uptown is perhaps its finest hour. NEXT WEEK: A masterpiece for your headphones.